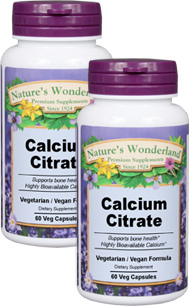 Calcium Citrate, 60 Veg capsules each (Nature's Wonderland) - Penn Herb Co. Ltd.
Calcium is the most abundant, essential mineral in the human body - 99% of it is located in the bones and teeth. Our synergistic formula blends the readily absorbable Calcium Citrate with vegetarian Vitamin D and Magnesium for superior bone health. Vitamin D as Ergocalciferol (a vegetarian source)...the "sunshine vitamin" unlocks Calcium bone health-promoting properties. Zinc, Magnesium...mineral support for bone metabolism. Bone Up On Your Health Today! Optimal vegetarian formula designed to support bone structure; maintains healthy teeth; supports blood pressure health; promotes cardiovascular health. As a dietary supplement, take 3 Vcaps daily, preferably with meals.